Horse looks at the target – click – treat. Horse touches the target – click – treat. Signal is added, “Touch” – horse touches the target – click – treat. 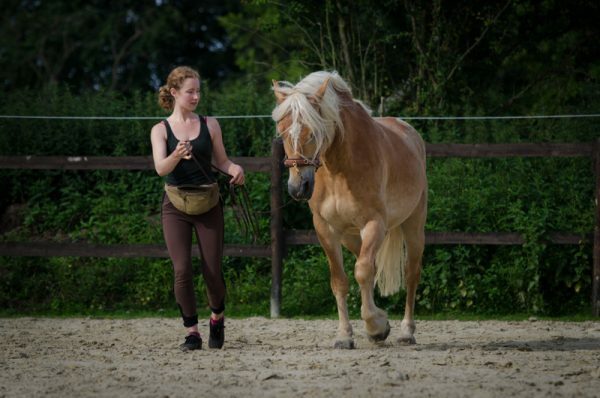 When clicker training is used for training horses, it can look quite technical. As though it would not be about communication, relationship or feelings anymore. When I first looked at clicker training, this was what I thought as well. I believed that the human would turn into a treat-delivery-machine without any other meaning for the horse. This association is also why I like to talk about training based on positive reinforcement instead of clicker training. In one of her posts on Instagram, Norah Kohle referred to two different kinds of horses and humans: The FEELER and the THINKER. I could immediately relate to these terms and thus like to use them for describing what happens between horse and human as well. For me, these terms describe a continuum of the state of mind a person can be in. On one end lies FEELING, on the other lies THINKING. We can be more drawn to one certain side of the continuum. A FEELER relies more on intuition and information that comes from emotion and is perceived subconsciously while the THINKER rather relies on her/his rational mind, thoughts and conclusions that they access through consciousness. How can clicker training influence our mindset when we are training horses? The theory that forms the basis for clicker training speaks to the THINKER inside of us. It is all about the quadrants, stimulus control, cues, training plans, shaping, timing, targets, splitting behavior into smaller pieces and so on. When we start to learn more about clicker training, we begin to ask questions like: „What is the reinforcer for this behavior?“ or „Is this negative reinforcement or positive punishment?“. And when we do not get the behavior we want, we question whether the value of the reinforcer was too low, our timing wrong or the frequency of clicks too low. Clicker training can push us towards thinking while disregarding the FEELING side in us. In my case, this had uncomfortable effects for both, Nathan and me as I am already by nature more of a THINKER. Thus, my thinking mind often goes nuts when I start to apply theories when interacting with horses, no matter whether it is related to clicker training or other ideas. Overthinking keeps me from accessing my intuition. You can see in my face that the THINKER is activated and Nathan’s nostrils show part of his emotional reaction to my state of mind. In this case it was caused by working with tack instead of at liberty which was rather new to us at this point of our journey. Does this mean that we should not think about our training? Of course we should keep thinking and questioning our training in order to improve not only the results but the way the horse and we perceive the interaction as well. To some point this is all about learning new skills. When we do not think about theories, ideas or advice from others, we can only make experiences that are based on what we already know. It is not impossible to learn important lessons without new input from other humans but then our horses have to do the job of teaching us all alone. We will miss all the valuable information that is based on the experiences of others. But considering this information can cause problems as well. The problem with this information and learning new skills is that we cannot integrate it into our toolbox of ways to interact with horses right away because we do not have made the experience with our own body. We can only integrate the information into our thinking mind. When we try to apply this information later in practice, we will not be able to do this without being lead by the THINKER inside of us. The THINKER needs to guide us through the new experience we are trying to make. Only after we have felt and perceived it with our own senses, we can get back to following the guidance of the FEELER. When I first tried clicker training, this was exactly what I experienced. I acted more like a machine instead of a living being. Because of my natural tendency of giving control to my thinking mind it stayed like this until I met Jana. Jana has the strong ability of differentiating between FEELING and THINKING. Even though she has a huge THINKER inside who absorbs every information she can get about horses, whenever she is with them, she gives control to the FEELER. Nathan reflects this very much as he is almost never stressed when the two of them are interacting, whereas I am often causing stress when I act against my intuition because I am overthinking. When I first watched Jana interact with Nathan, I was a little shocked by the amount of treats she gave for practically everything. She did not use a clicker or another bridge signal. They were walking around, doing some tricks and she was feeding treats like all the time. What I saw had almost nothing to do with clicker training the way I knew but it worked for them. Jana’s actions were not based on theory. They were based on what she felt and what her intuition told her to do. For some years we broke all the rules. We built our own theories, our believes, our experience. We were experimenting and discovering. I let go of all the rules I thought I had to follow. And I got to know how to let the FEELER guide me. Later on I began to let my thinking mind guide me through trying to apply new information. This time I knew when I had to stop and FEEL again. Jana uses clicker training to teach Nathan to put his head into her hand. The expression on her face clearly shows that her actions are guided by FEELING. And Nathan is obviously feeling into the exercise and interaction as well. Today I know that both ends of the continuum are important. There is a time for thinking. There is a time for feeling. When we learn how to switch between one and another we can apply clicker training without becoming a machine that does click+treat. Try to observe whether your actions are guided by FEELING or THINKING. How does this change your horse’s overall reaction to you? You might also notice a change in your ability to enjoy the interaction with your horse. When you notice that your thinking mind is causing problems in a certain situation, try to calm down your thoughts in order to be able to listen to your intuition again. Focusing on your breath or how your feet touch the ground can help with bringing your focus back to feeling. Ask yourself when time is right for thinking and analysing. 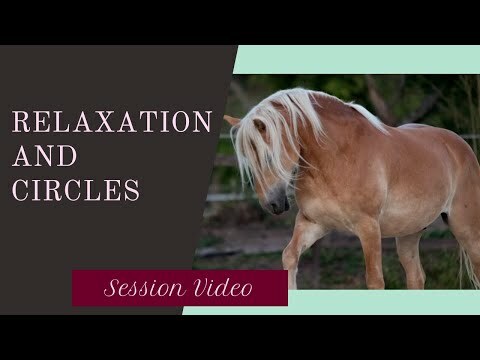 When you feel that you need to apply new information for solving a task, take a break from the interaction with your horse and think through what you are going to do next. Try to imagine the movements, the way you will perceive the horses actions and your reactions to it. Then calm down your mind again and let FEELER and THINKER work hand in hand for guiding you through the process of applying new knowledge in practice. In the next post I will provide more practical tips on how to do clicker training while balancing between THINKING and FEELING and focusing on the relationship you have with your horse.